You must be a member of the Prague Walk & Talk Group to attend this activity. Would you like to join this group? 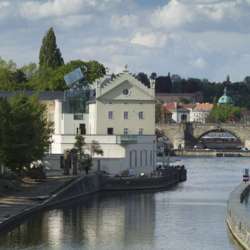 This time we will connect our walk with a visit of one of the best Prague Museums at Kampa. We will meet at the corner of Protected content , walk over the river a reach Kampa. At the museum we can visit the permanent exposition and/or also temporary expositions. Dependent on which parts do you want to visit, the ticket ranges between Protected content (permanent expo only) and Protected content (all expos). Once we are ready we will continue our walk to the Lennon Wall (a very special ‘monument’, piece of art which is constantly changing and relates back to communist era), walk through Hradcany to Vojanovy sady (an interesting park where you can meet peacocks, maybe not during winter though :D) and continue to Malostranska, where we will finish our short walk this time.